Plantronics HW510V Headset - Headsets Direct, Inc. 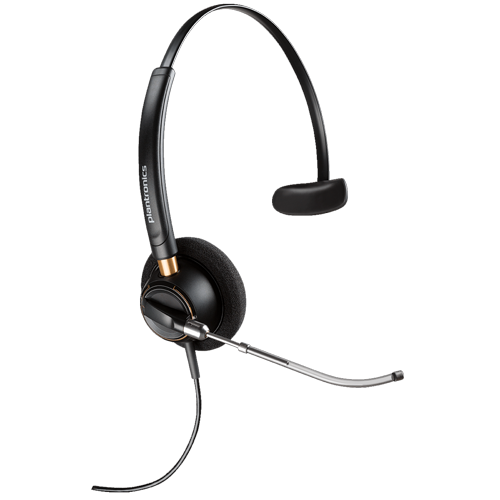 The brand new Plantronics HW510V is a business-grade, corded headset. The HW510V is a single-ear headset with a headband that goes over the head. The V in the product name stand for voice tube, and the Plantronics HW510V uses the latest voice-tube technology. The voice tube is replaceable, and the voice tube is what picks up your voice and transmits it to the microphone that is on the speaker circuit board. The HW510V is ideal for the average-to-quiet environment. If you are in a louder environment, you should look at the HW510, which is the same model, but uses a noise-canceling microphone instead of a voice tube. This very light weight (only 50 grams) headset has a soft, foam ear cushion, which is also replaceable. The flexible temple pad guarantees a secure, comfortable fit for all-day wear. Also, the headband on the Plantronics HW510V headset is adjustable, so you can easily position it just right on your head. The voice tube is not flexible, but it telescopes, so you can extend it, so you can position it for the best sound. The voice tube is also able to rotate, so you can flip it to work on either the right ear or the left ear. The HW510V works well for those who need to keep in touch with what is going on around them. With only one ear covered and the other ear open, you will be able to hear what is going on around you and talk to your coworkers while keeping your headset in position. This headset comes with a clothing clip that you clip onto the edge of your shirt or collar. So when you pull on the cord or turn your head, it pulls at the clothing clip and does not move the headset. This makes the HW510V headset very universal; you can use this headset on any application, you just need the right bottom cable or amplifier. That is why the most important thing to do before you purchase this headset is to give us a call and tell us what your application is; if you are plugging into a desk phone, PC, iPhone, Samsung, or a tablet. Then we can tell you which cable or amplifier will work for you. The cables and amplifiers are always sold separately, so you can get the right one for your application. The Plantronics HW510V is a good business-grade headset, made for the office environment that is on the quieter side. It has great sound quality; you’ll really like the sound you get through this headset. If you have any questions on this or any other model, give us a call at 1-800-914-7996, or visit us online at www.headsetdirect.com.